You are welcome to join us at St Michael’s, Offham, early in the morning of Easter Sunday for a special Easter Dawn service. 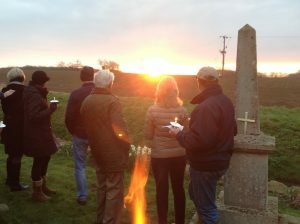 We will be lighting an Easter fire and gathering with prayers and readings in the Churchyard to greet the sunrise on Easter Sunday and remind ourselves how it felt for those first disciples as they went early to Jesus’ tomb, only to discover that it was empty. Rev David Green will be leading the service. The service takes place outdoors so make sure you dress appropriately. Please note that THERE IS NO CAR PARKING at the church. You may be able to make use of the car park next door at the Betts farm. Please park respectfully.